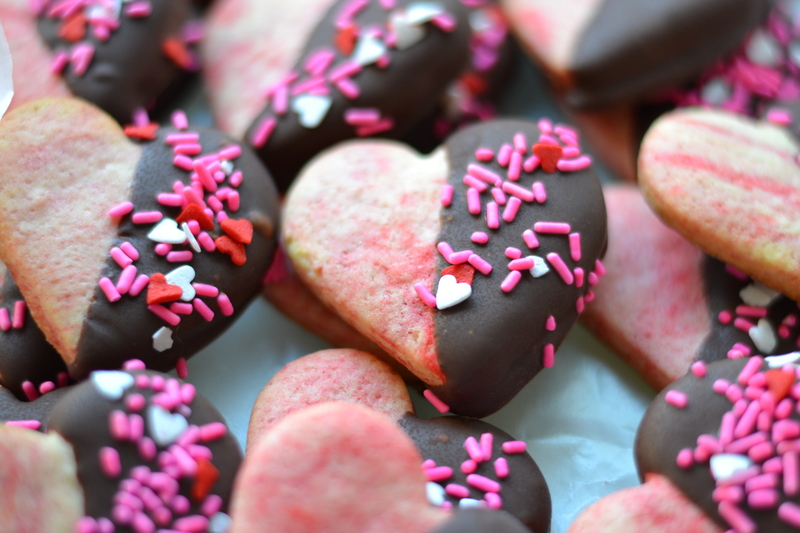 Heart-shaped Chocolate-dipped Sugar (sort of) Cookies with Sprinkles. 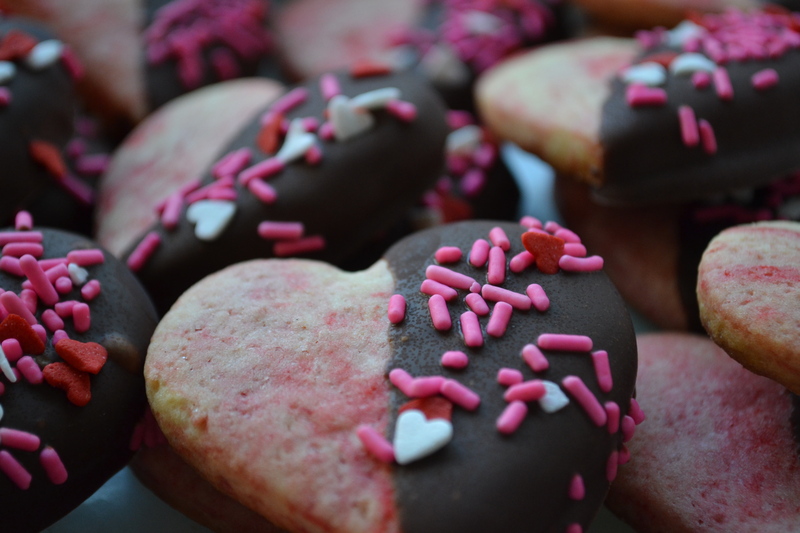 I love making Valentine’s Day desserts, which is funny, since I really don’t love Valentine’s Day. But I do love making things that are pink, or red, or heart-shaped – or better yet – all of the above! 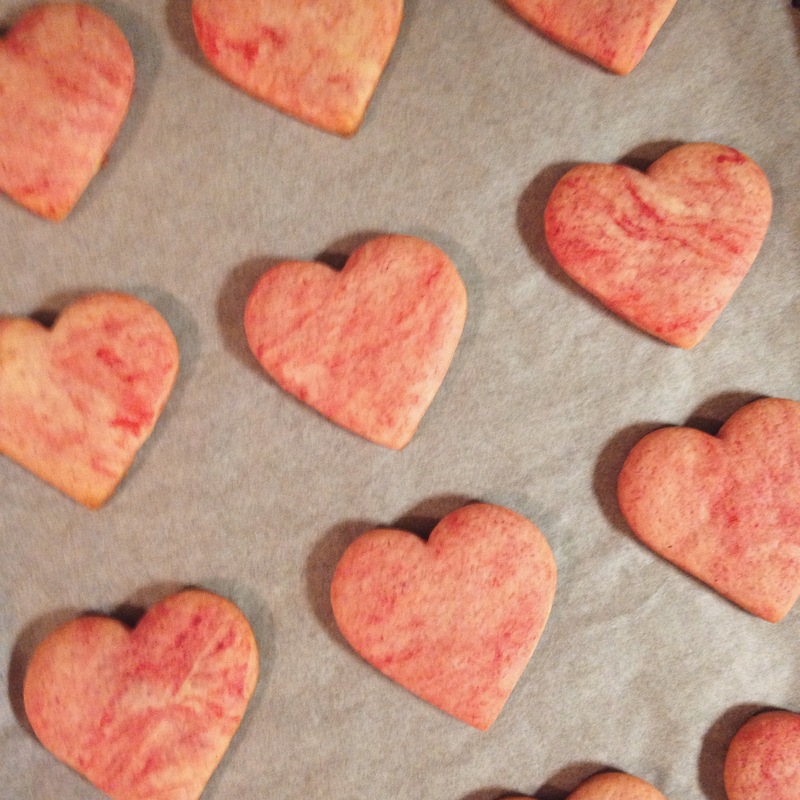 I had this sugar cookie recipe made with Monk Fruit in the Raw that I was dying to try, and this heart-shaped cookie cutter that I had yet to use, so I decided on heart-shaped sugar (sort of) cookies for this year’s V-Day Small Indulgence of choice. 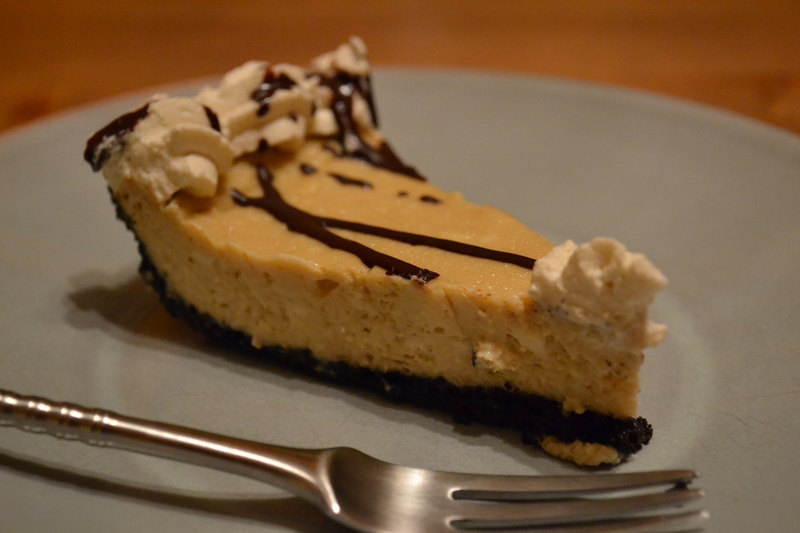 I followed the recipe pretty much down to the teaspoon, except that I added one thing – red food coloring. 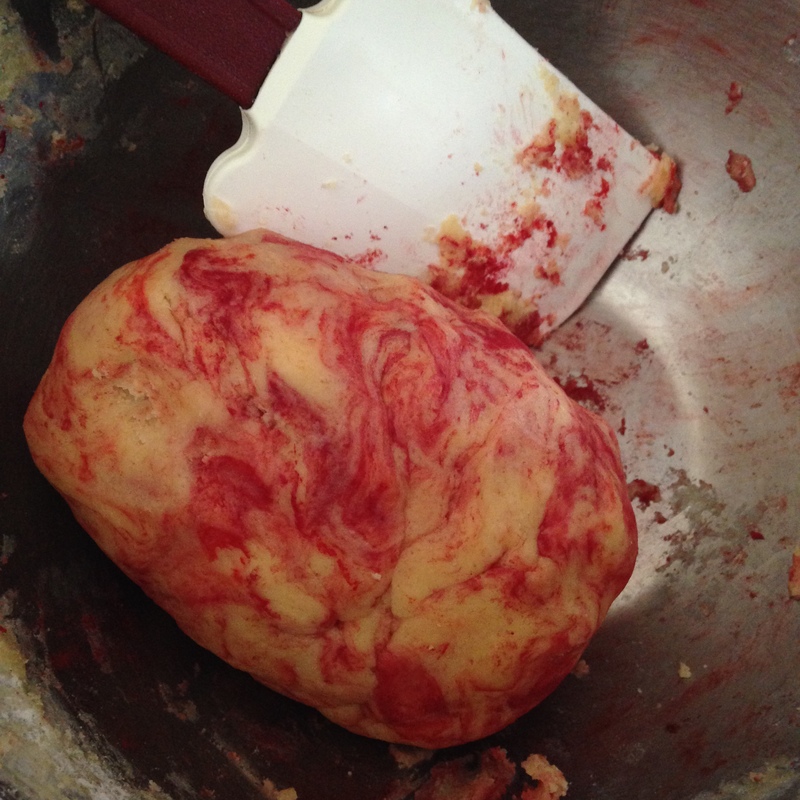 I wanted my cookies to be pink and swirly – and I figured a small amount of red food coloring would do just that. I wound up with dough that looked a little like a human heart. I figured that meant I must be on the right track. I chilled it for a few hours, then rolled it out and cut it into heart-shapes. The result was swirly pink hearts, just as I had hoped! 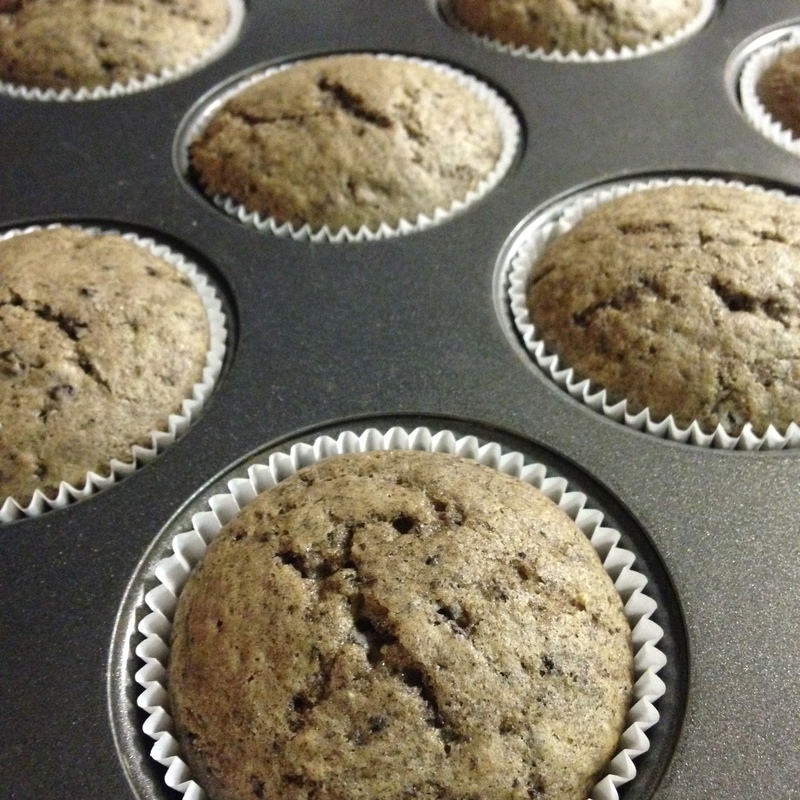 I let them cool, and then thought that although they were cute as they were, they needed something more. 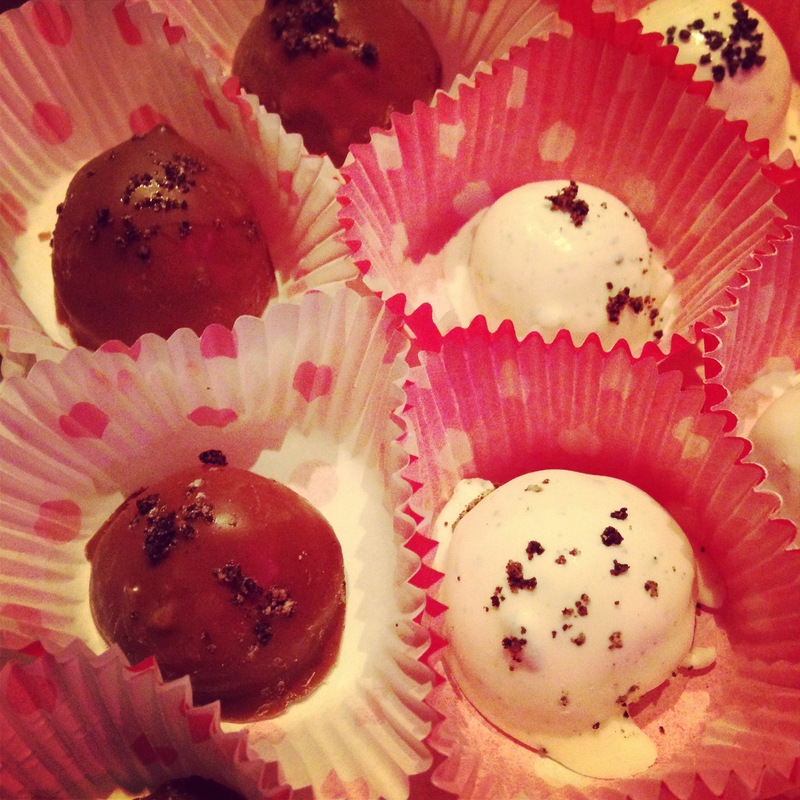 So I melted down some milk chocolate, and dipped them. Oh, and added some festive sprinkles, while they were still wet. I chilled them for a bit, then packed them up, and shared them with my fiance, my parents, my friends, and my co-workers. I guess I really don’t mind Valentine’s Day that much after all – it gives me the chance to spread the love, by doing what I love. 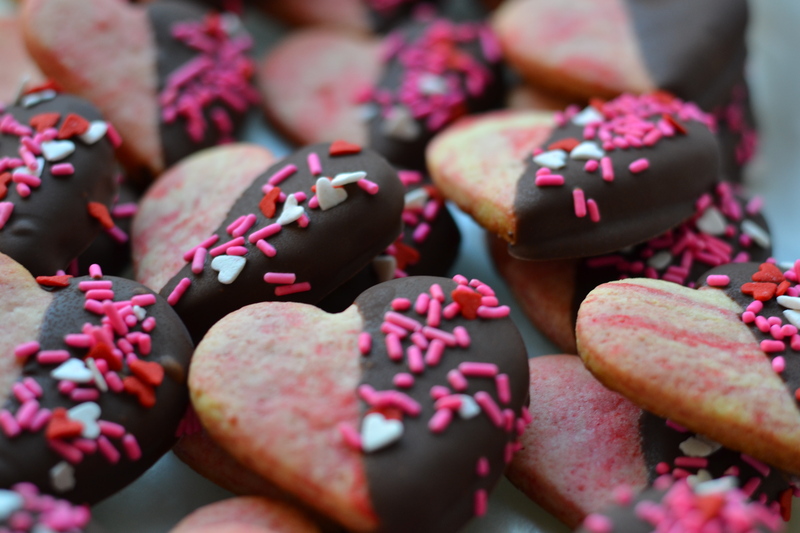 I suppose it’s true what they say: love actually…is all around…and in cookies. 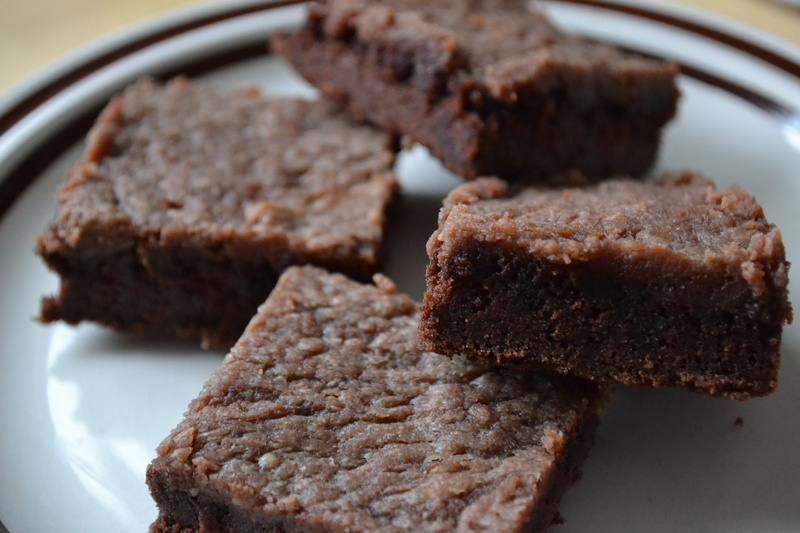 Recipe: Salted Caramel Hazelnut Cake Brownies. That’s a long name right there. 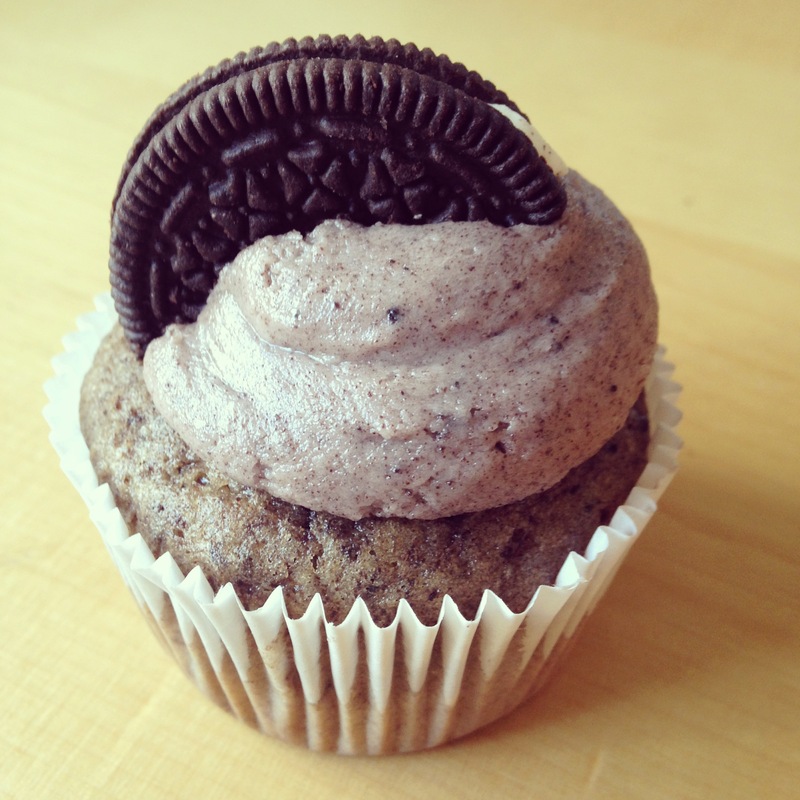 Although this was clearly not Nutella, I deemed it a suitable replacement, and marched onward with the cake. Upon further investigation, I realized that the recipe called for butter – a lot of it. I, alas, had only a little. Refusing to leave my house in the snow, I improvised, replacing most of the butter with shortening. 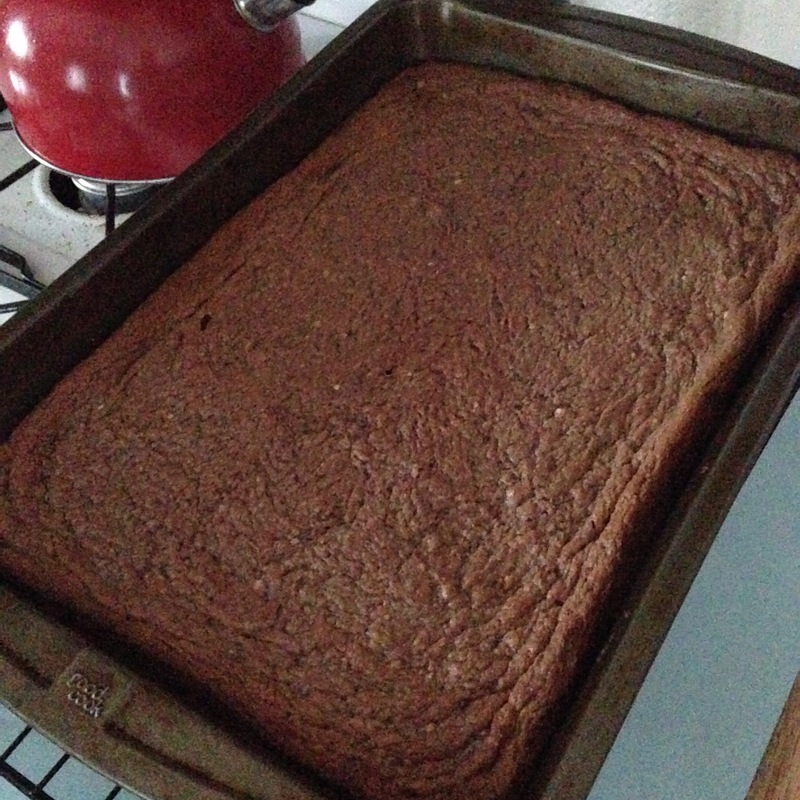 The batter seemed awfully thick, more like brownies than cake, but I didn’t let that dissuade me from baking it. When it was done baking, it definitely looked more like brownies. 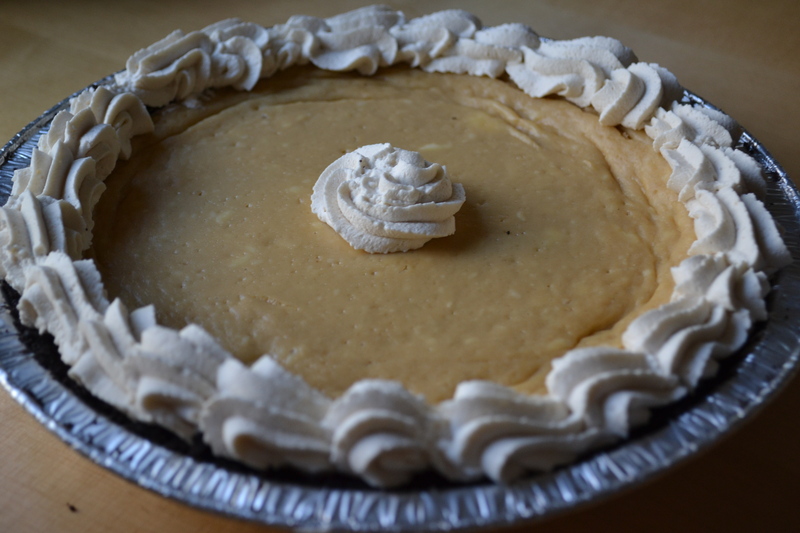 It smelled pretty good, and appeared to have baked properly, so I went with it, and waited for it to cool. 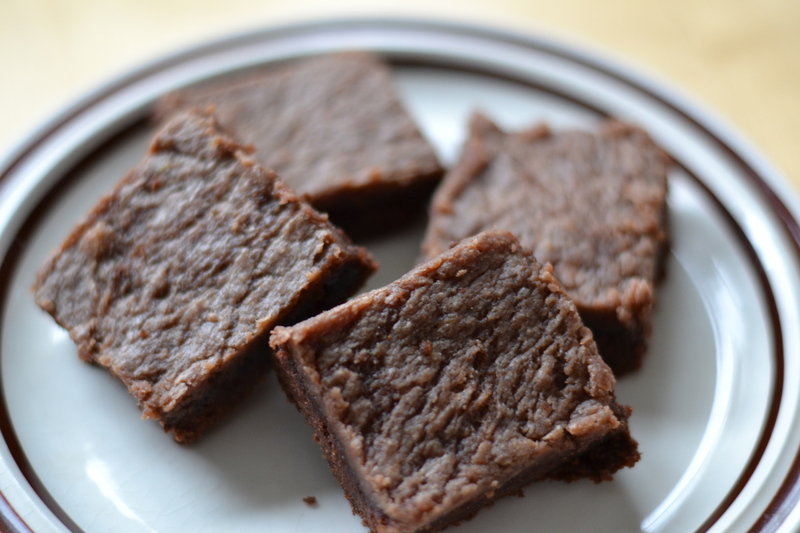 When it finally cooled, I sliced into it, and sure it enough, it was definitely more brownie-like. 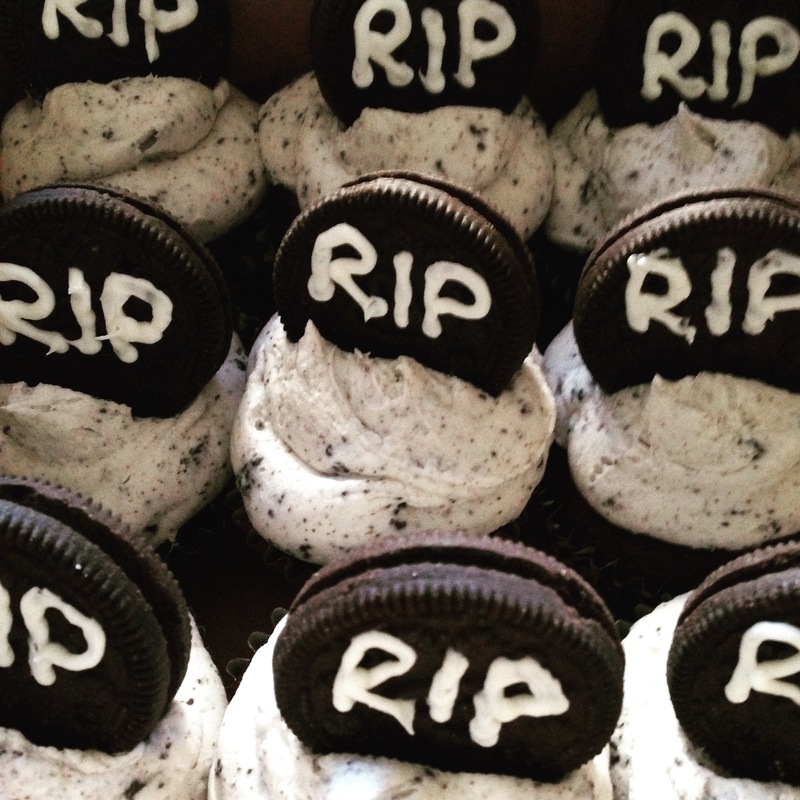 The next step was to eat one. And then another one. And then another one. They were THAT good. 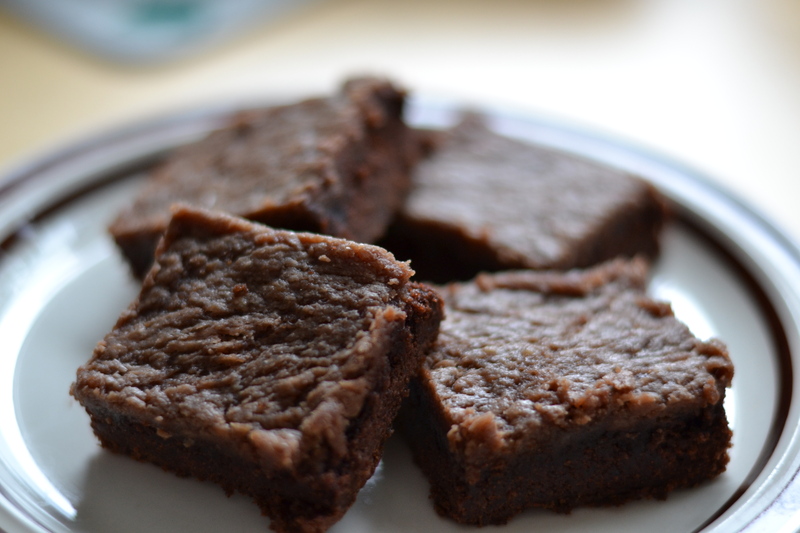 Two people even said they were the best brownies they ever had (wow!). Even though they were neither Nutella nor Cake like the original recipe claimed, the Salted Caramel Hazelnut Cake Brownies were definitely a major success, and will be made again. 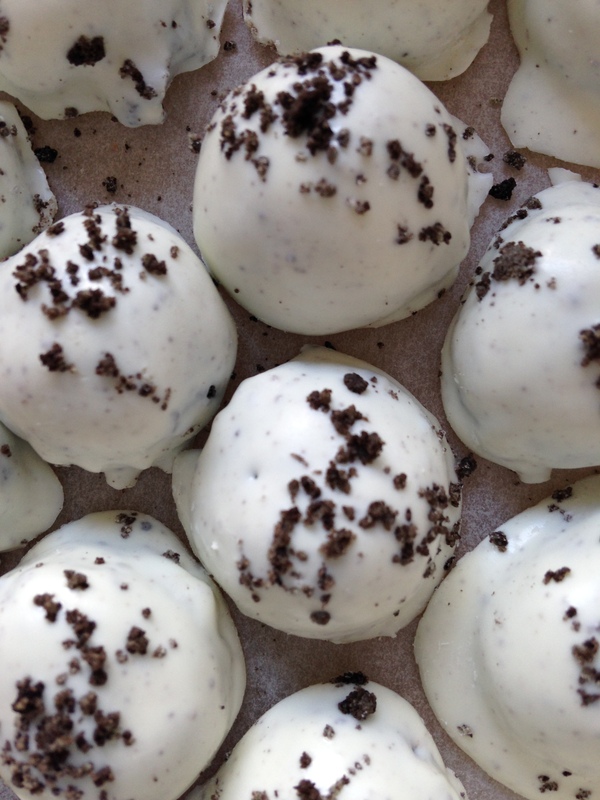 Maybe I’ll even make them for my own wedding this Spring….and now you can make them too! Salted Caramel Hazelnut Cake Brownies. Preheat the oven to 350. 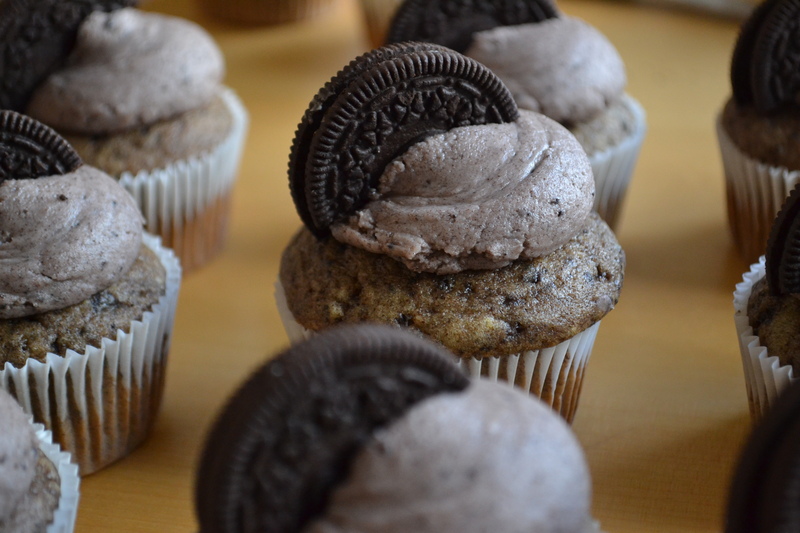 In a large bowl, combine the cake mix, egg and shortening. The batter will be thick. 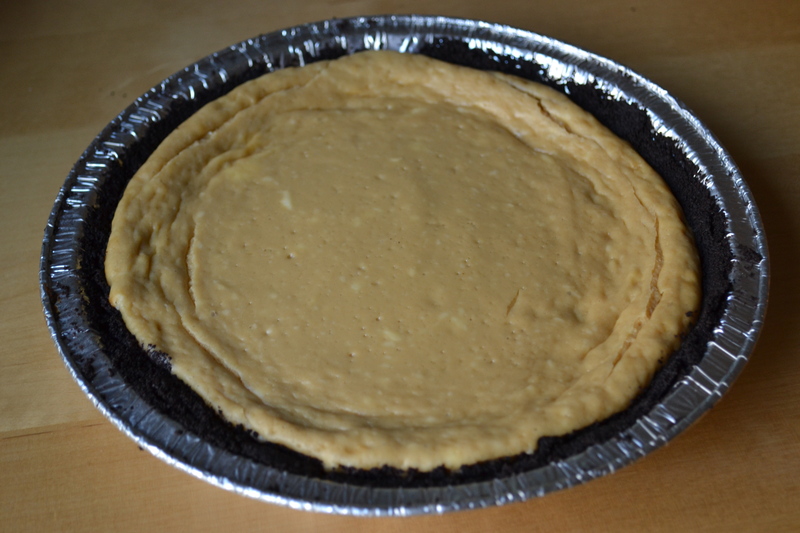 Grease a 9×13 pan, and spread the batter across the bottom (using your hands makes it easier). Set aside. 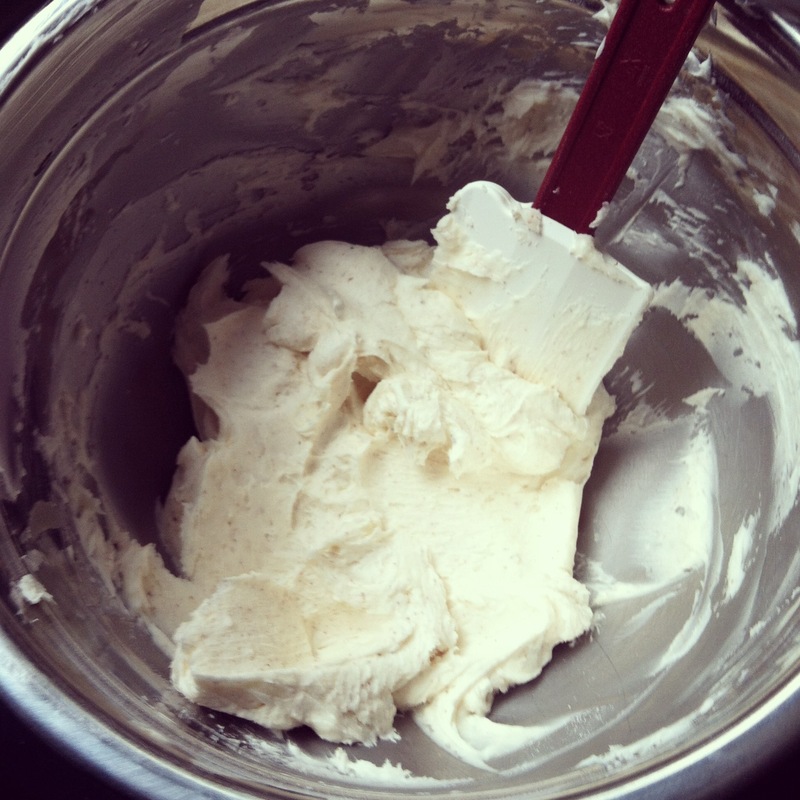 In a separate bowl, cream together the cream cheese, butter, and shortening until smooth. 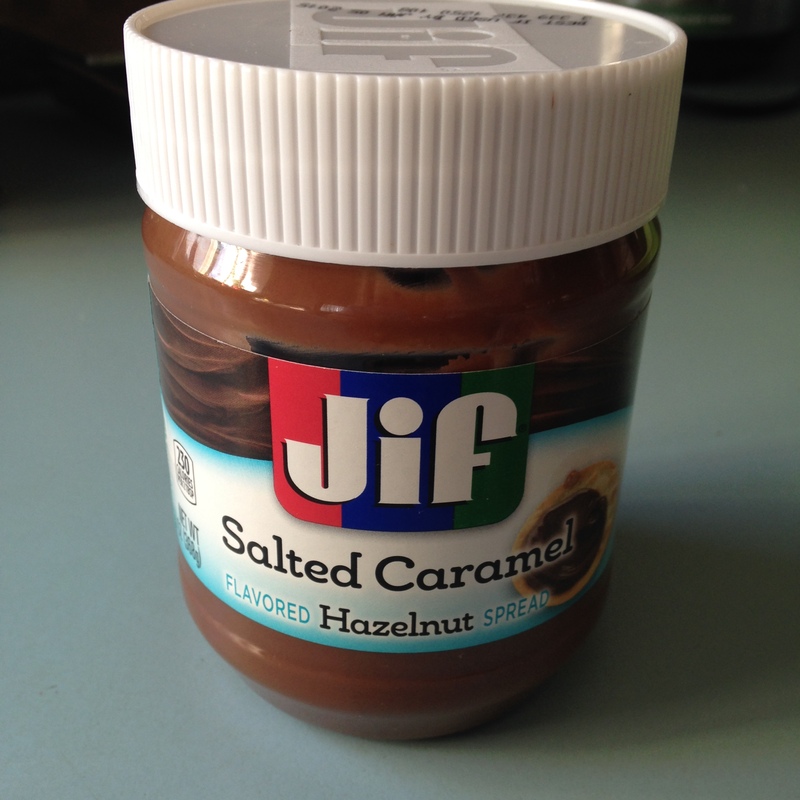 Mix in the sugar and salted caramel hazelnut spread until there are no lumps. Pour mixture evenly on top of the cake mixture in the pan. 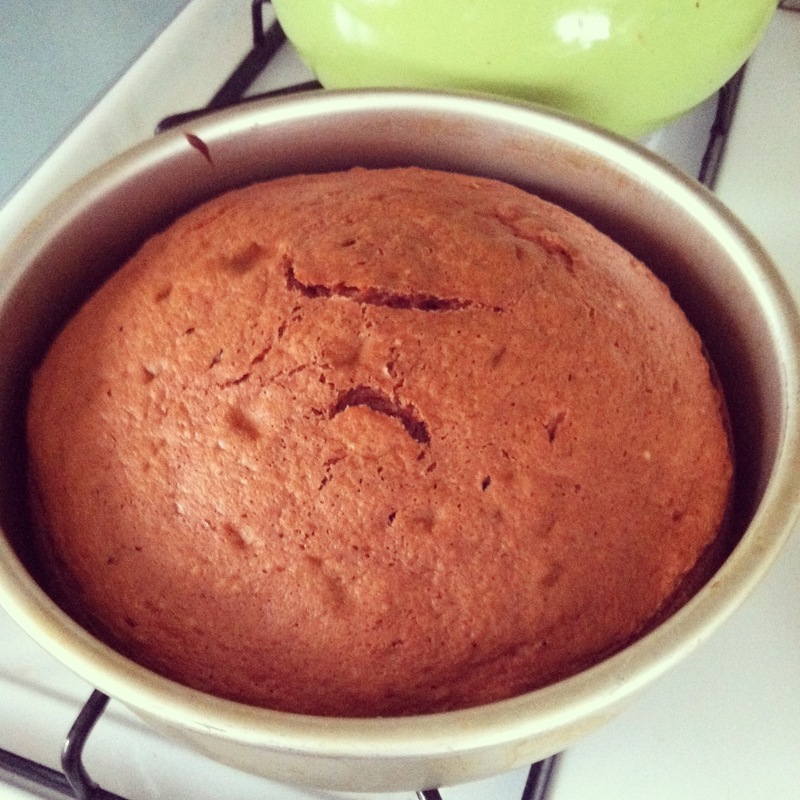 Bake for 35 minutes, or until the cake starts pulling away from the sides of the pan. Let cool completely, cut and serve. 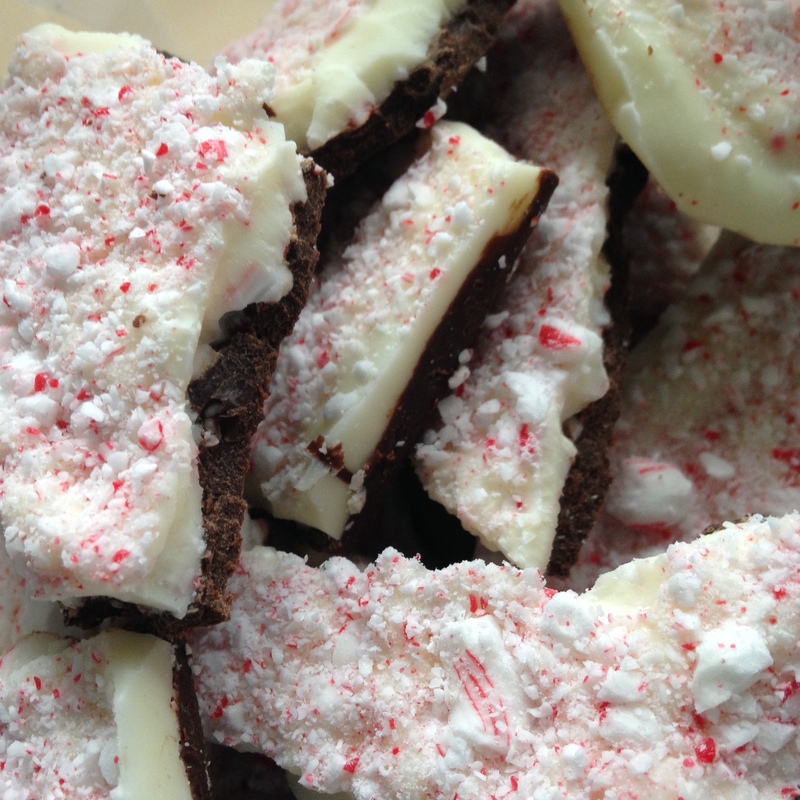 Peppermint Bark: A Holiday Treat with Bite. I look forward to eating it every Christmas. I am not sure why I haven’t ever tried making it myself before now, especially knowing just how much I love it. Maybe I thought it wouldn’t hold up against all the other barks I’ve eaten over the years, and my baking ego would henceforth be crushed. Whatever the reason, I decided it was a dumb one, and I went ahead and made it this year. 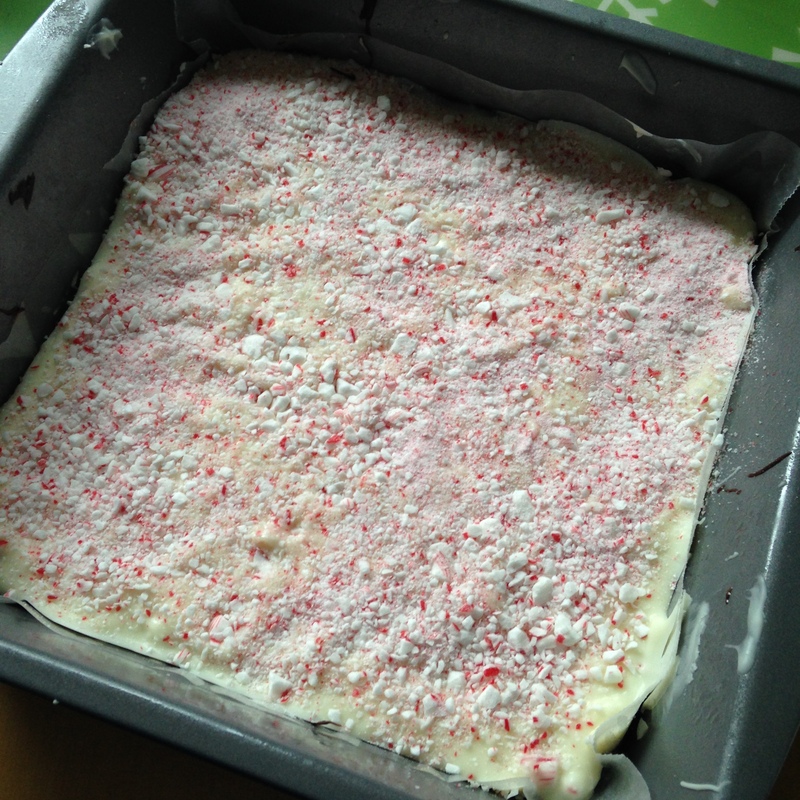 A whole pan of peppermint. I greased an 8×8 pan, and then covered it with wax paper. 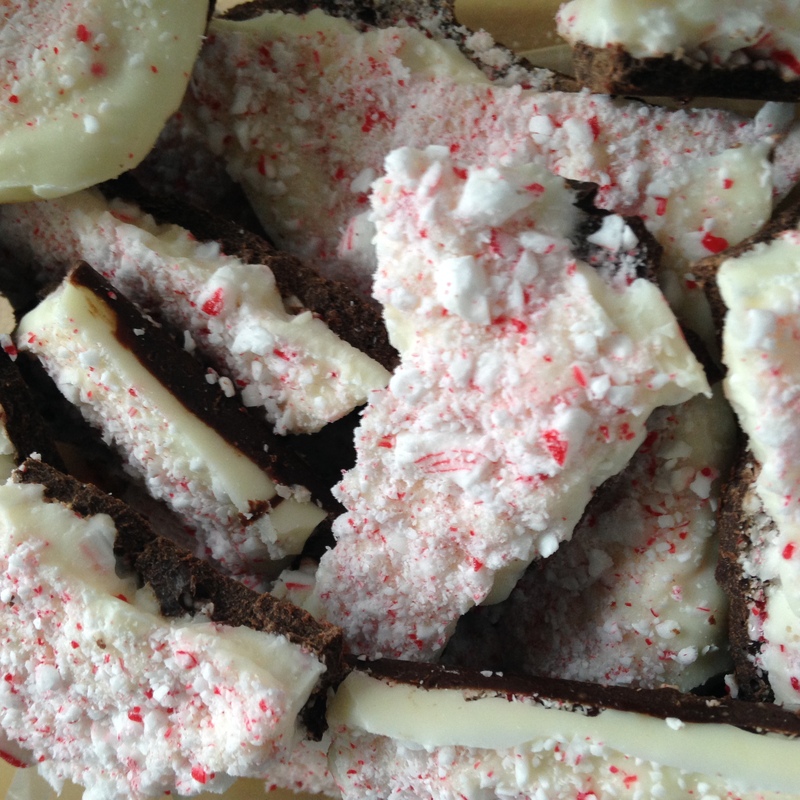 I melted up some semi-sweet milk chocolate, crushed a bunch of candy canes, and then topped it with melted white chocolate (and more crushed candy canes). Then I let it refrigerate until it set. Next, I broke it up into random-sized pieces, and served. It was as delicious as any bark I’ve had before it. The problem now is that I have so much of it. Resistance is futile. 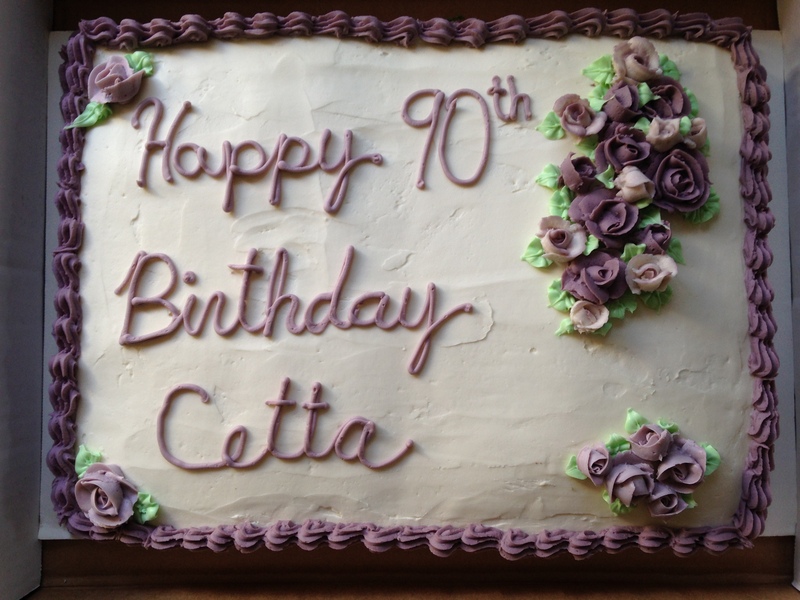 This past weekend, I attended a birthday party for my Aunt, who is turning 90 (how awesome is that???). I was tasked with baking her a cake. 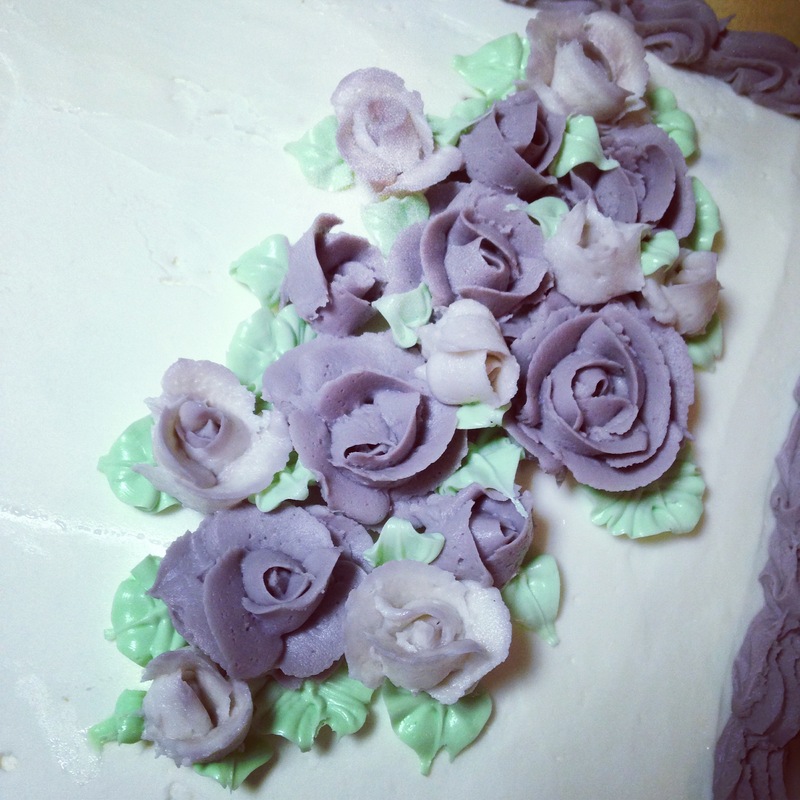 As you know, I love baking cakes, so I was thrilled to get a chance to do it. At the same time, I was a little nervous. 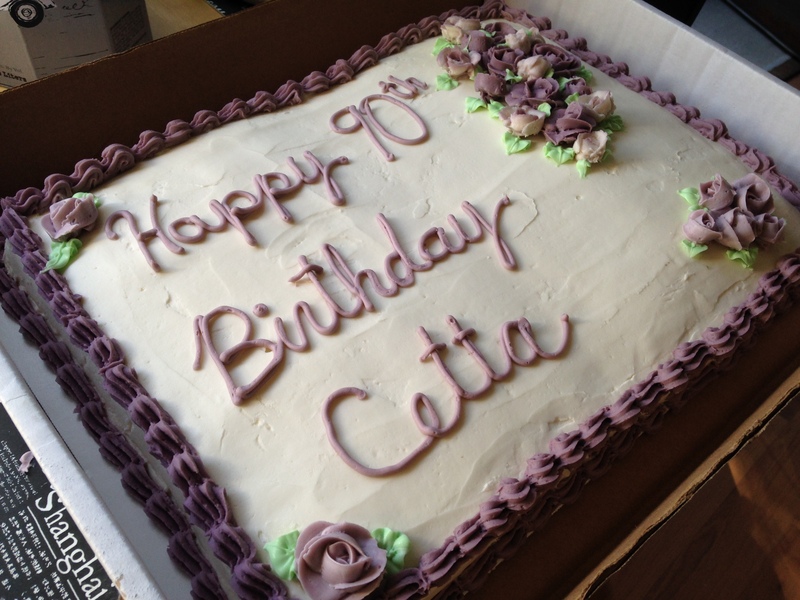 Here was a woman who in her prime was an amazing baker herself (she’s the one that gave me all the baking pans, including the infamous Lamb Pan), and she has had 89 other cakes to compare this one to. 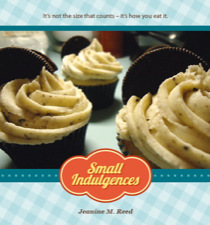 I had two pieces of knowledge that could give me an edge over at least some of the previous cakes – I knew she loved chocolate, and that her favorite color was purple. 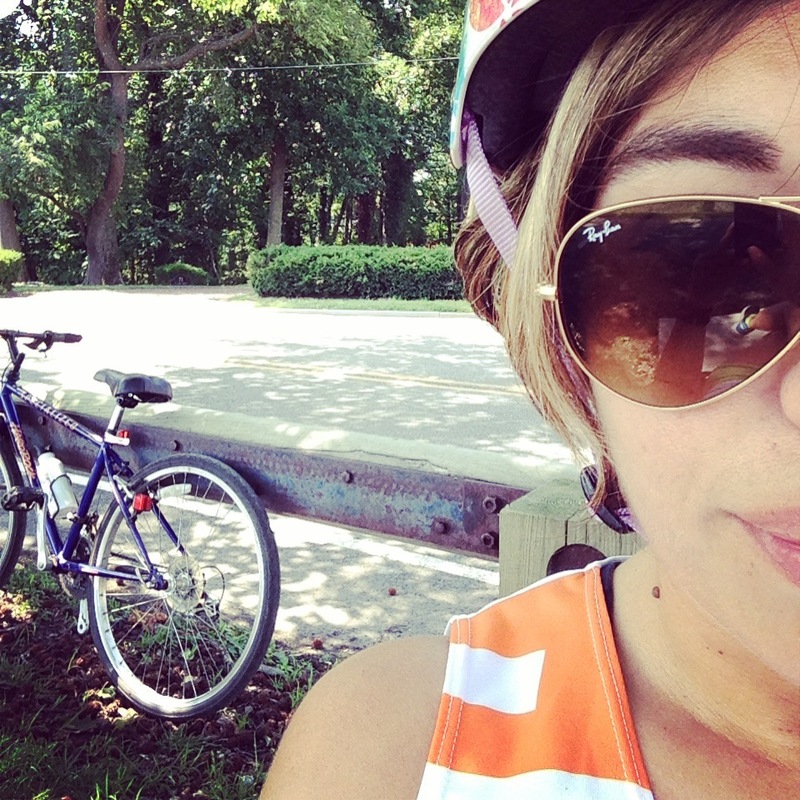 So, I went with that, and here’s what happened. Because the cake was for a party, it was kind of big (a half sheet cake). We had to clear out the entire bottom row of our fridge to make a space for it! I did have a lot of fun making all the flowers though. 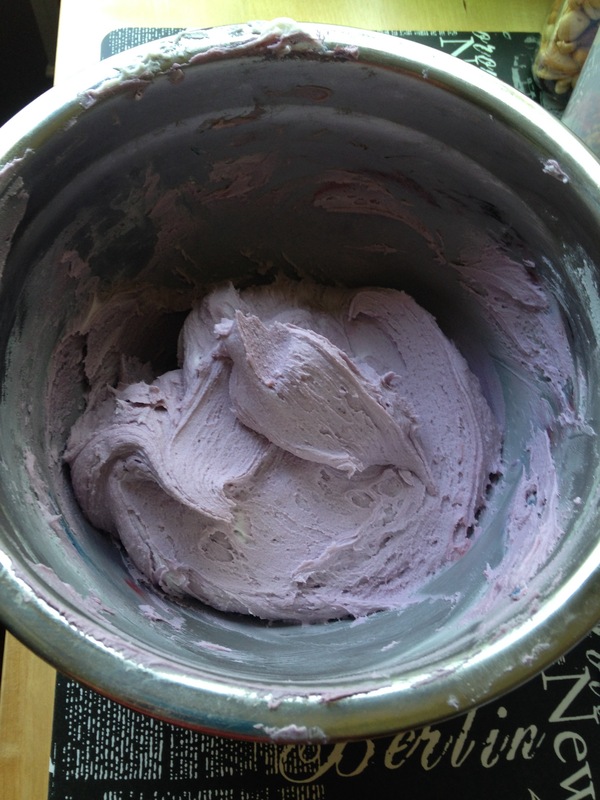 First, I mixed the icing until I came up with the perfect shade of purple. 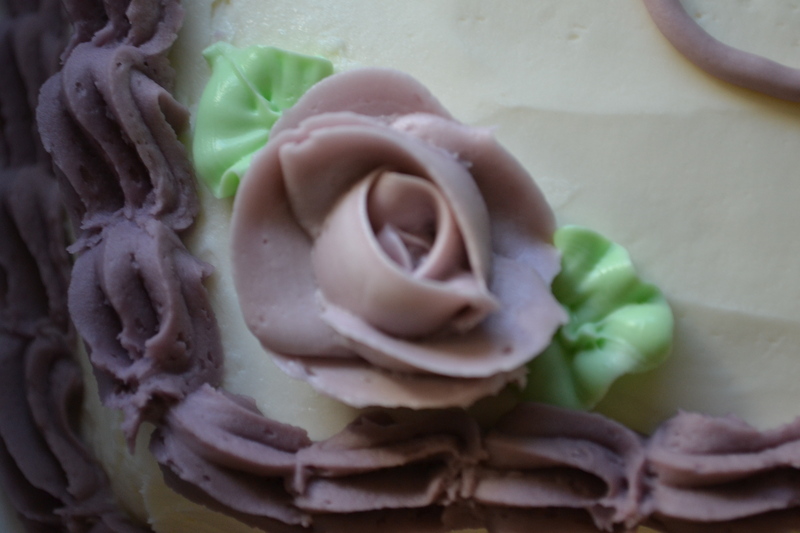 Then, I started piping flowers. As I went along, I mixed in some plain white, so they wound up being varying shades. 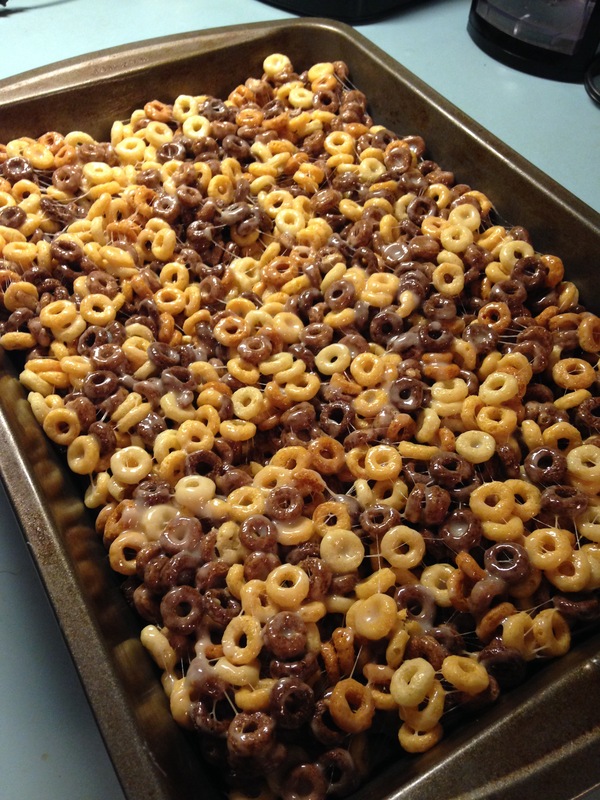 Chocolate and Peanut Butter Cheerios Treats. 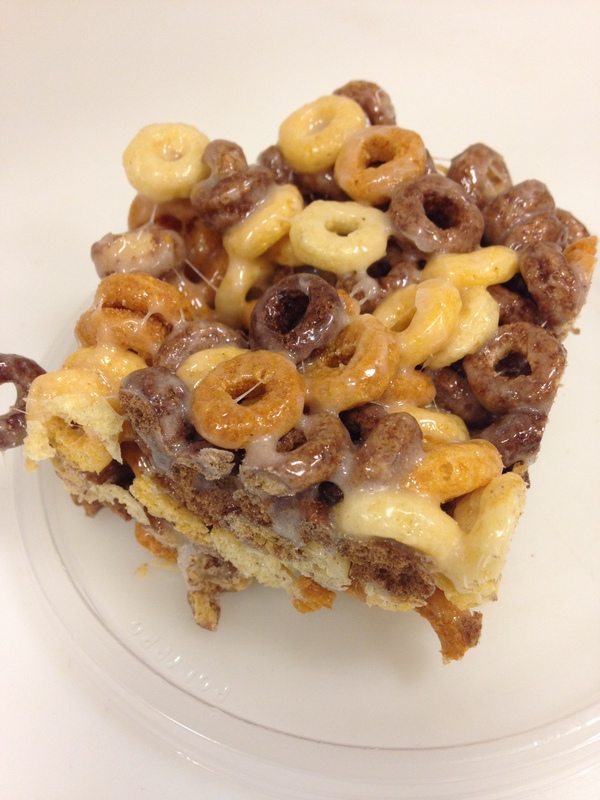 So the other day, a co-worker of mine said something along the lines of “Wouldn’t it be awesome to make Rice Krispies Treats with Chocolate and Peanut Butter Cheerios instead of Rice Krispies?” I responded with a resounding “YES! !” and then remembered I had a bag of marshmallows at home just waiting to be used. 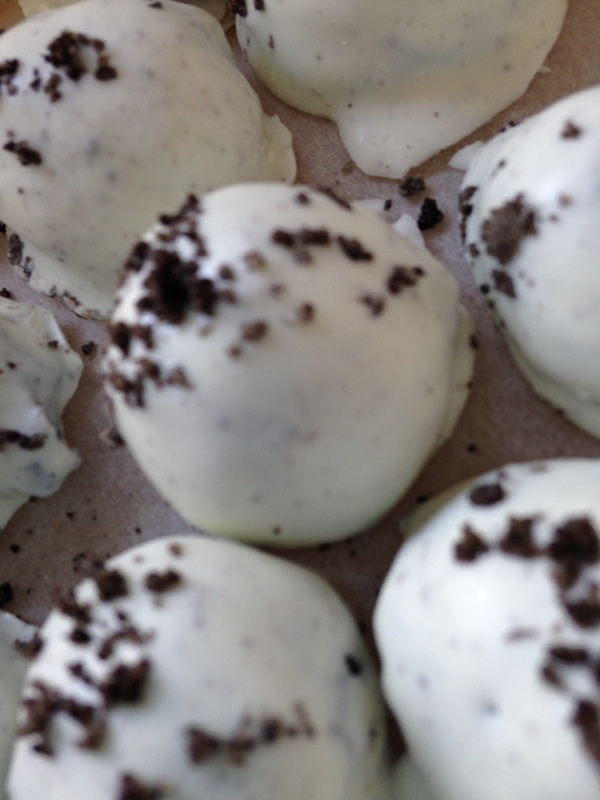 “I’ll make these tonight!” I declared. So when I got home, I made a beeline for the kitchen and started prepping ingredients. My fiance came home mid-prep, and wanted to go out for a run. So I left the butter in the saucepan (since it had to be melted anyway) and out we went. Upon our return, he noticed the chunk of butter in the pan on the stove, and gave me his classic raised eyebrow “what on earth are you doing now?” look. He was in for a very pleasant surprise. I started with a box of Chocolate Cheerios and a box of Peanut Butter Cheerios (both of which are delicious on their own, but even better when combined). I mixed them with the marshmallow and melted butter and spread them out into the pan, let them cool, and brought them into work the next day. 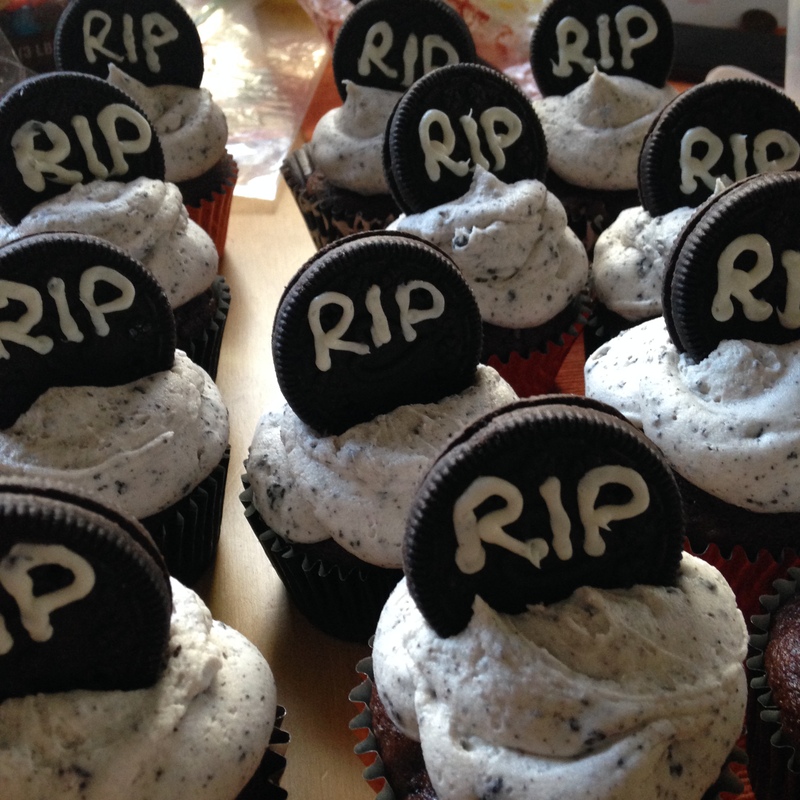 They were a raging success, and will be made again, I guarantee it. Cheerios are the new Rice Krispies. We cut them into squares, and found them to be denser then the traditional Rice Krispies version, but the chocolate, peanut butter, and marshmallow combo was magically delicious, fo’ sho’. 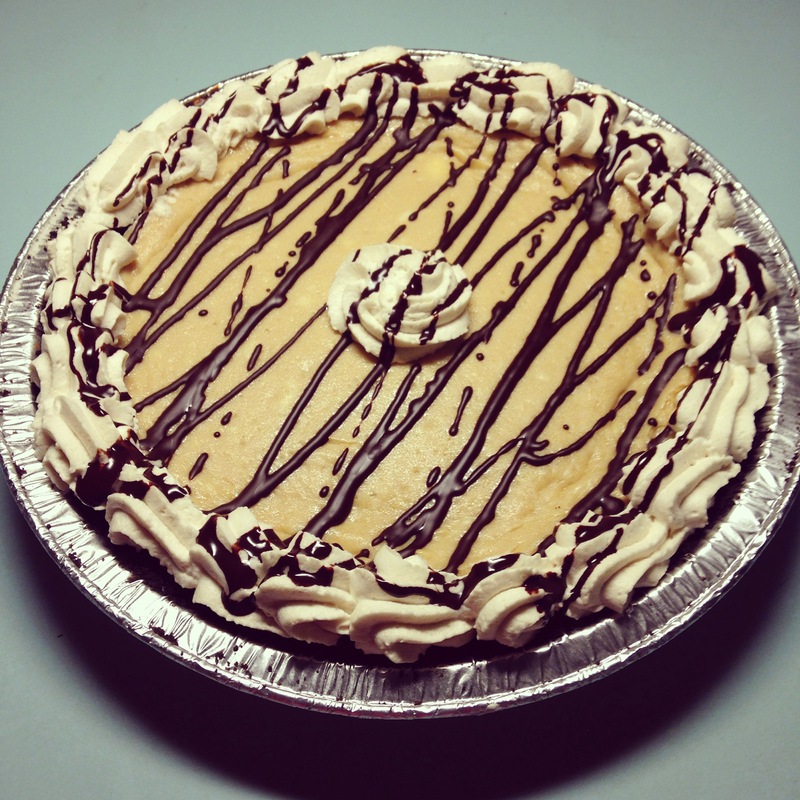 Chocolate and Peanut Butter and Marshmallow, oh my. The recipe is very simple. You just sub in Cheerios. But here’s the actual measurements I used, in case you want to give this quick and easy perfect-for-any-party treat a try on the fly. In a medium saucepan, melt the butter. Over low heat, add the bag of marshmallows, and mix until smooth. In a large mixing bowl, combine the Cheerios. 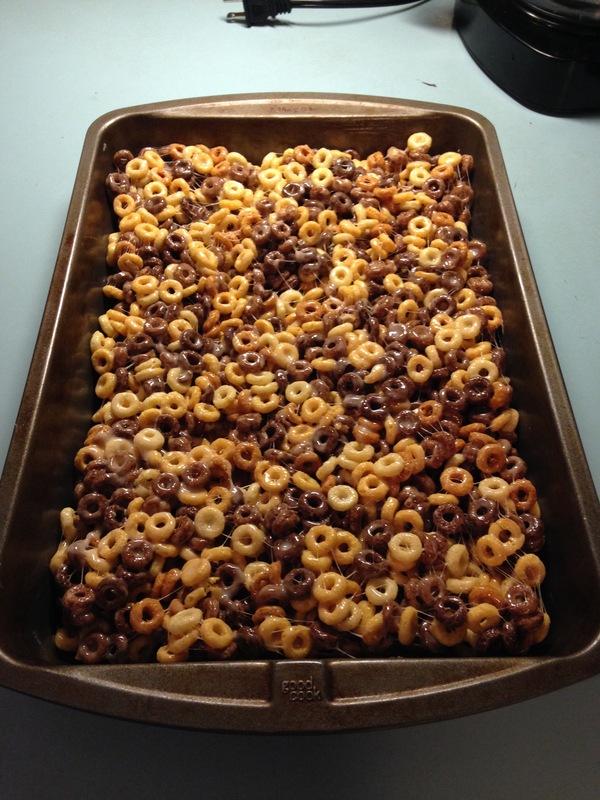 Pour the marshmallow mix over top, and stir until all the Cheerios are completely coated. 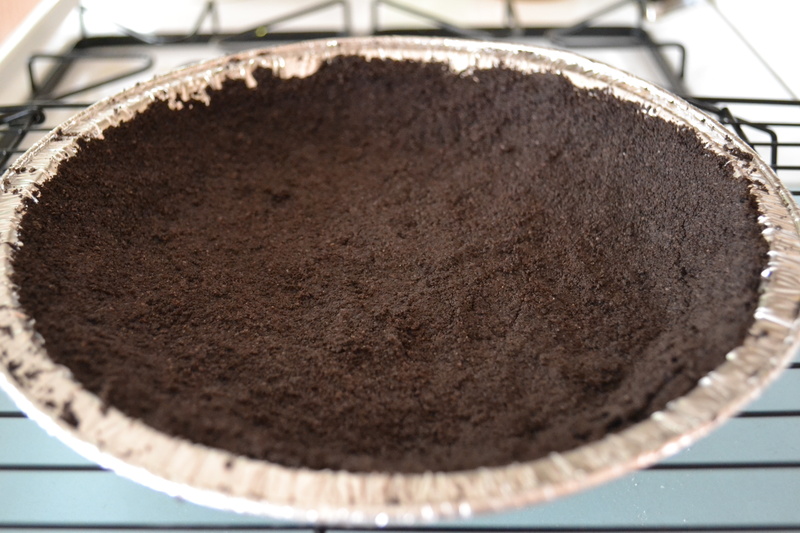 Grease a 13×9 baking pan, and spread the mix into the pan. Let cool. Cut into squares. Eat! I have this friend who I’ve got this little tradition with. For the past two years, at the beginning of the year ,we’ve each gotten the same book – one of those “365 Days of Something or Other” type books, and we’ve each independently read the passage for each day, and then texted each other with our thoughts. It’s a fun little way to stay connected, and we decided to continue it this year. The book of choice for 2014 is called “One Good Deed: 365 Days of Trying to Be Just a Little Bit Better” by Erin McHugh. The book doesn’t actually start on January 1 like the others did, so we just flipped to the first, and started there anyway. Why am I telling you this? Well, about a week ago, one of the daily passages involved a cake. A “Wine Cake,” to be exact. And it even included the recipe. It sounded easy and tasty, so I thought I’d try making it and see for myself. 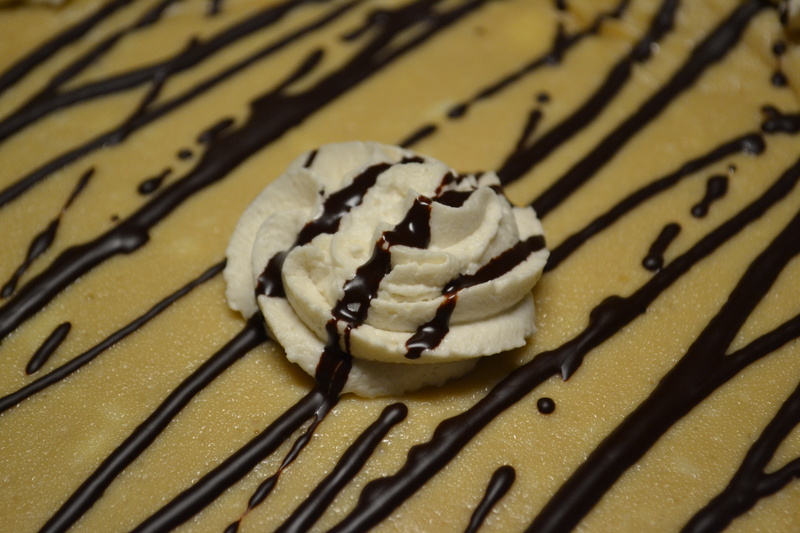 After making the decision and prepping the kitchen, I realized I was missing one of the ingredients – a box of instant vanilla pudding. I only had chocolate, and a lot of it for some reason. It was snowing, and I wasn’t about to leave my house for one box of pudding….so, you guessed it, I threw in the chocolate instead. 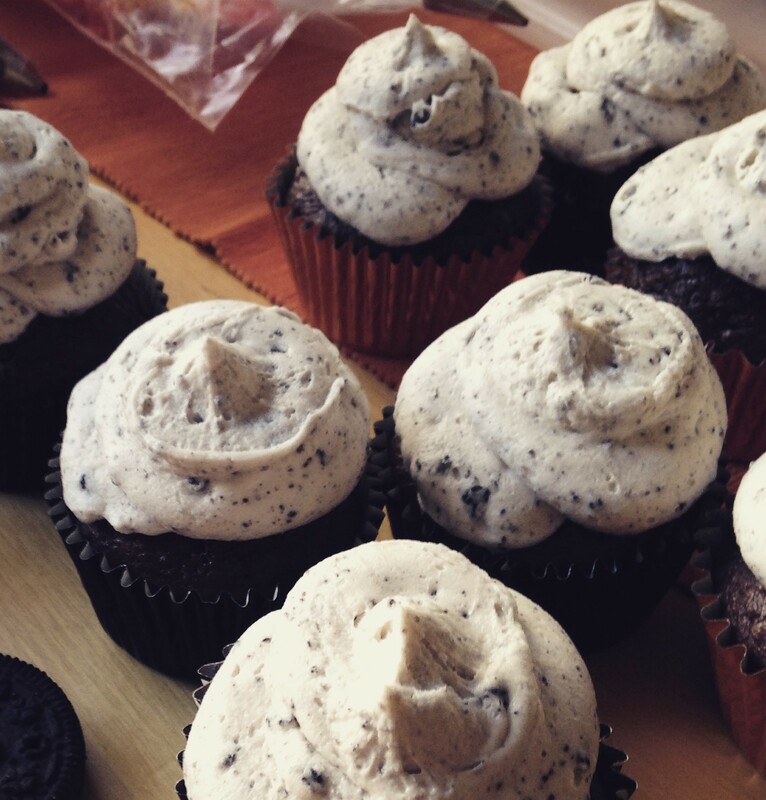 improv baking takes the cake. 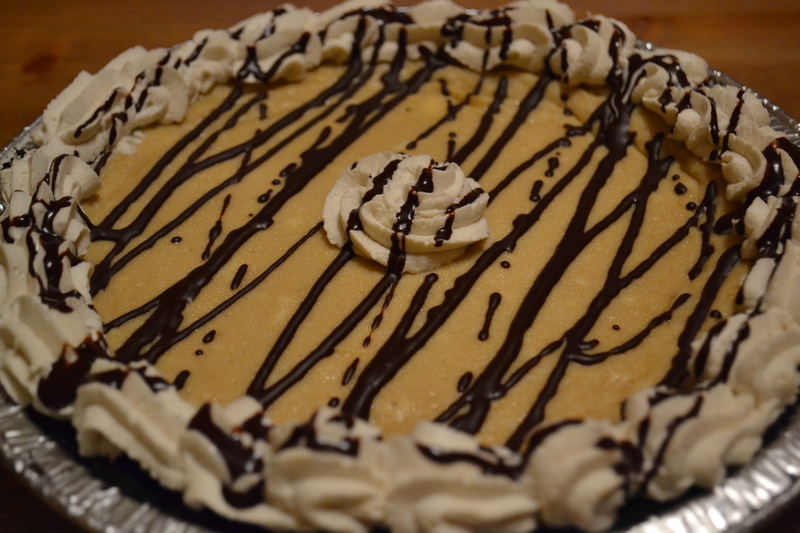 It looked good – really good. 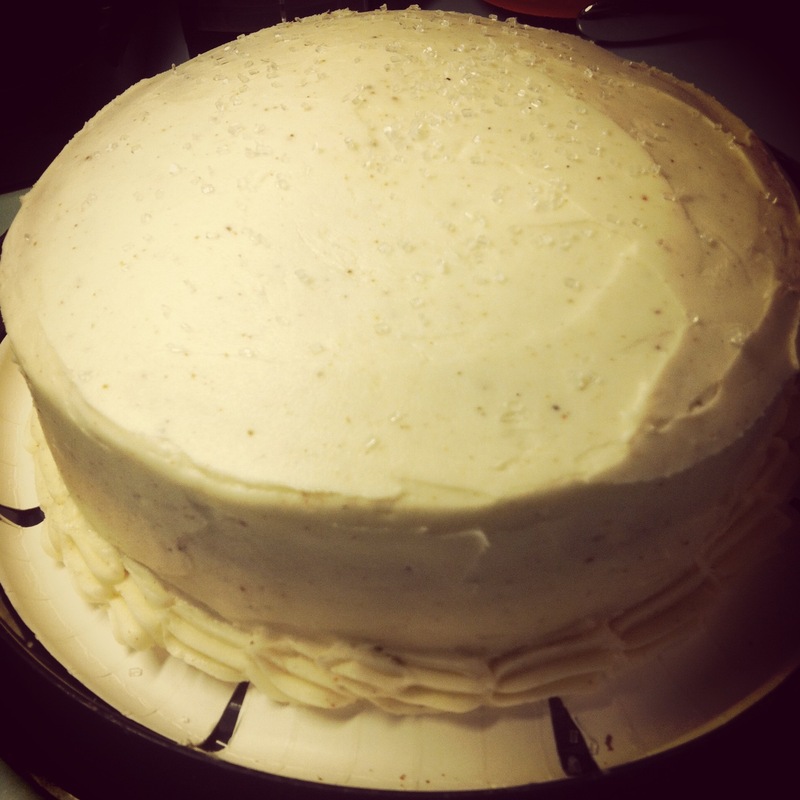 But then another obstacle was thrown in my path – there was no recipe for appropriate frosting included with this cake. 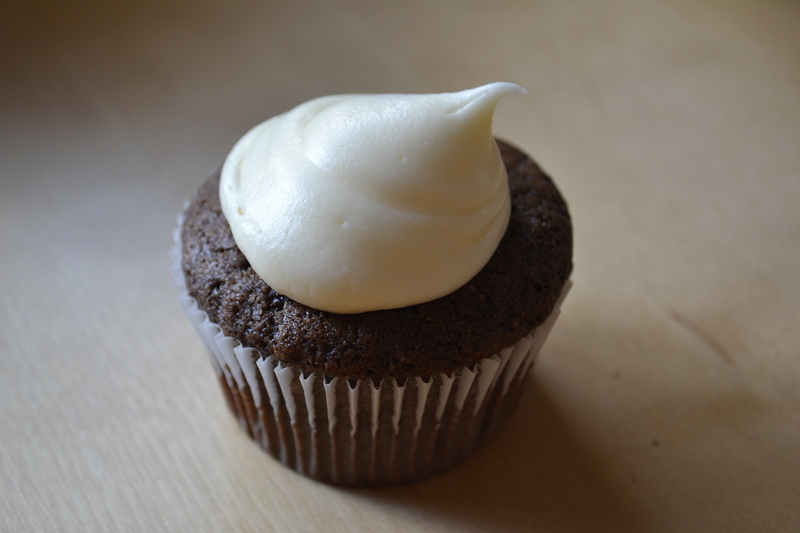 I thought that some kind of wine-based buttercream might work out well, so I did what any good baker would do — googled “white wine frosting.” I got nothing. 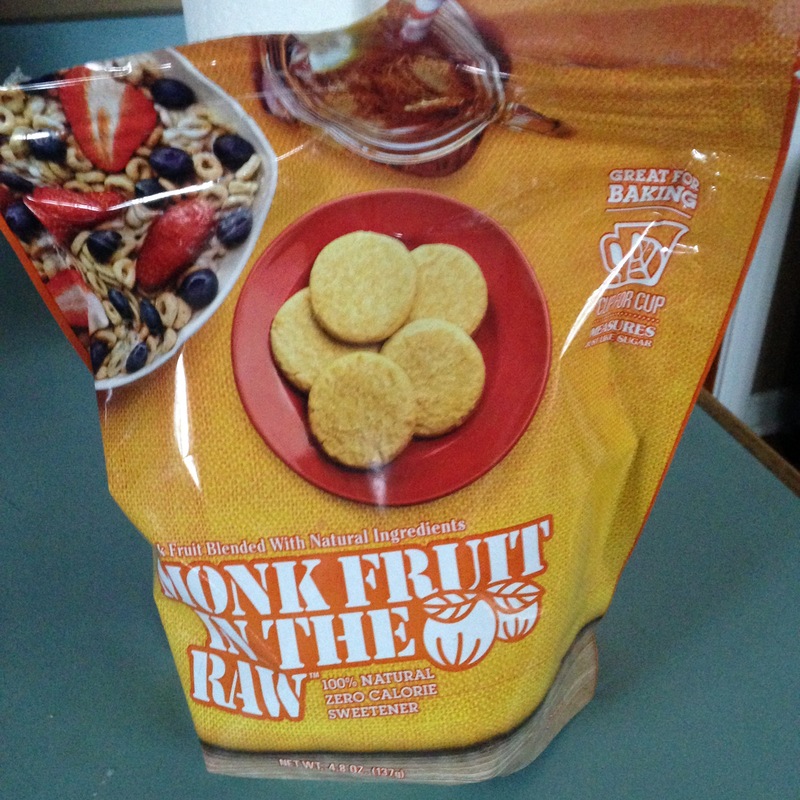 Well, I got SOME things, but nothing that really seemed to be what I envisioned. 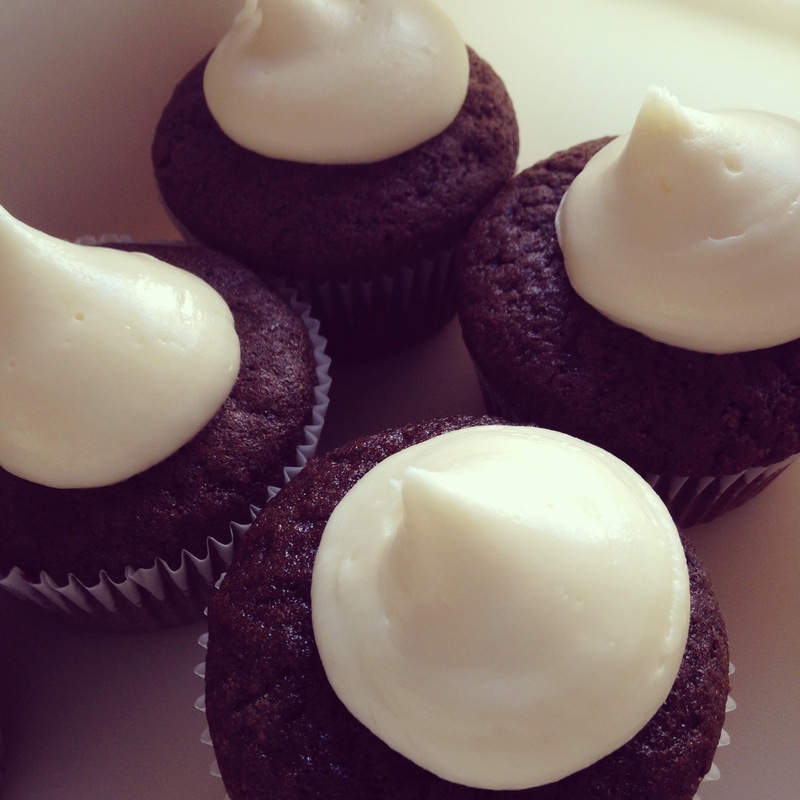 So, I did the next thing any good baker would do — made up my own White Wine Buttercream recipe. 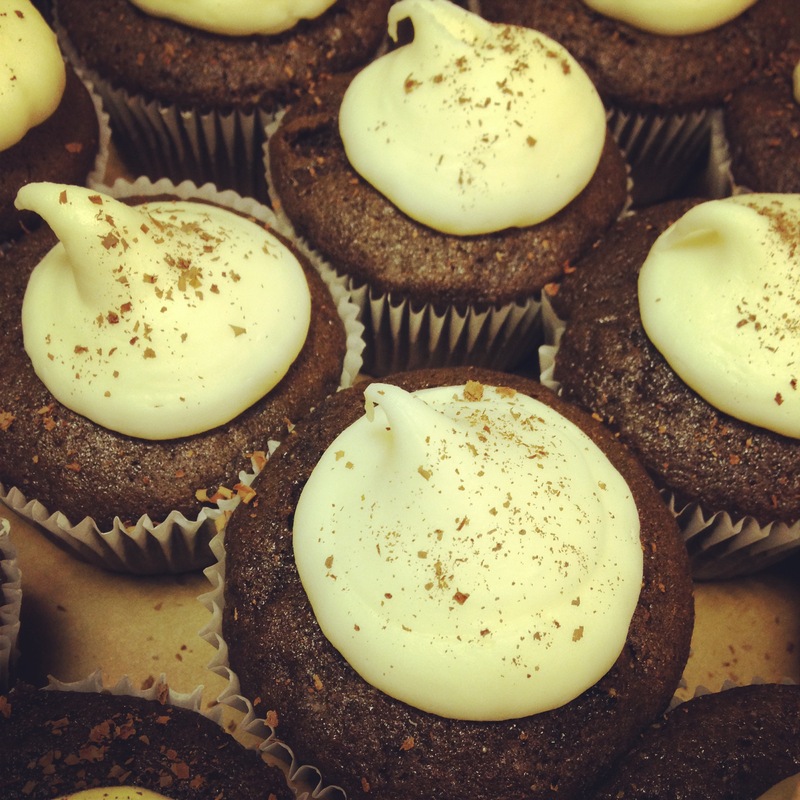 a little wine with your frosting. 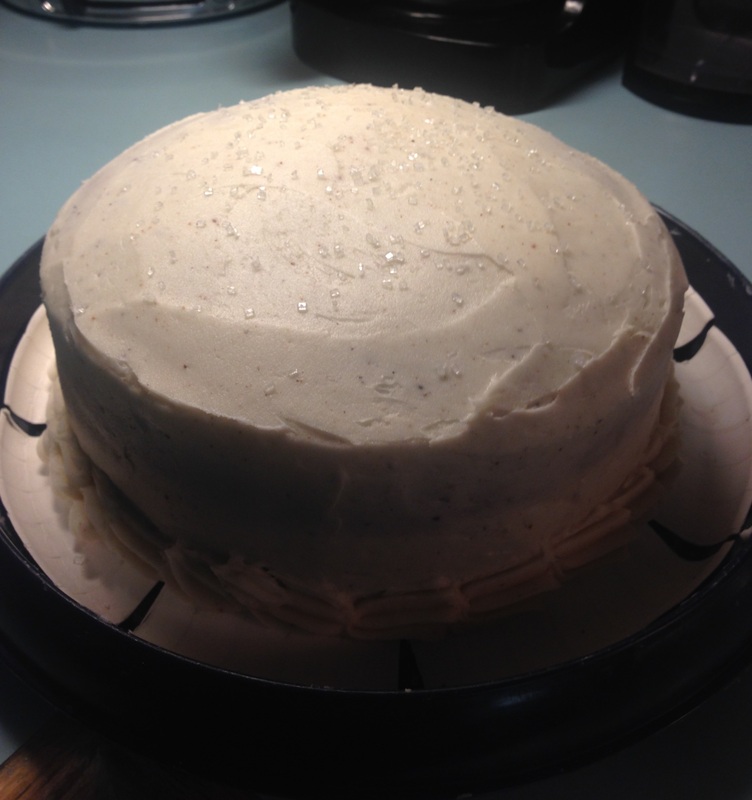 I frosted the cake, and decided it needed just a little something – some pizzazz or “flair”, if you will. So I made it sparkle (with sugar crystals). look at me, i’m sparkling. Preheat the oven to 350. 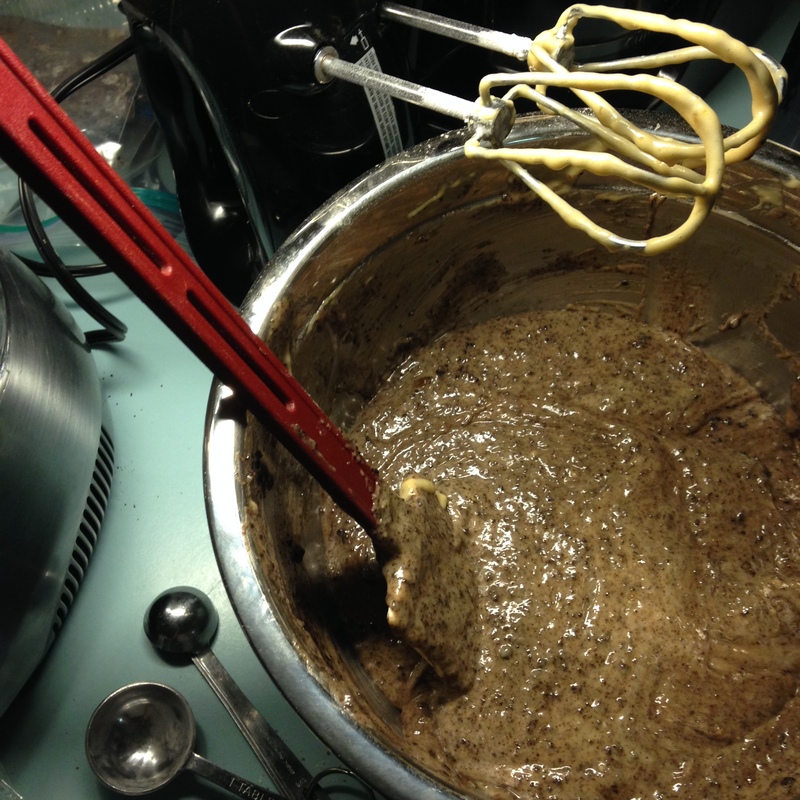 In a large bowl, whisk together the cake mix, pudding, and nutmeg. In a small bowl, whisk together the eggs, and add them to the dry ingredients. Add the butter, oil, wine, and and water, and mix by hand or with a mixer until well blended. Grease two 8” round pans, and divide the batter evenly among the pans. 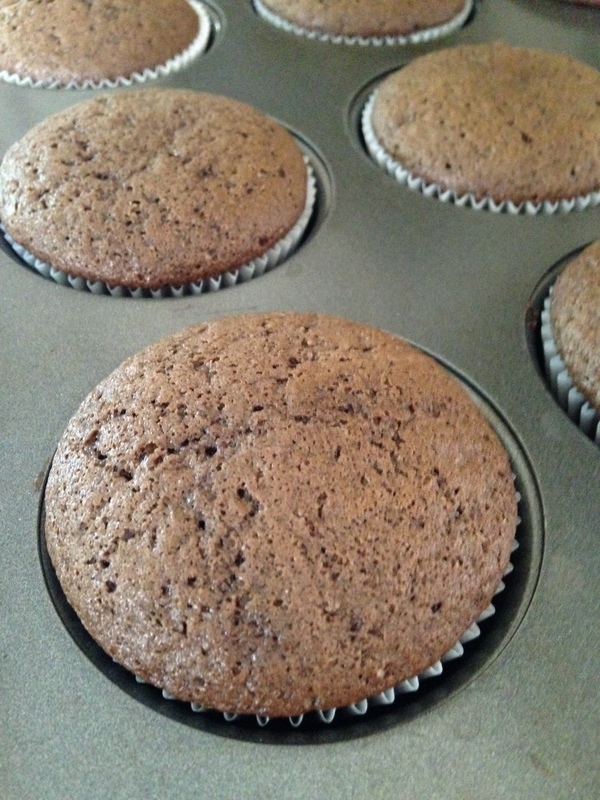 Bake for 25-30, or until the top springs back and the cake pulls away from the sides of the pan. Cream together the butter and shortening. Add the confectioner’s sugar, wine and nutmeg, and mix until smooth and consistent.